Individuals and companies are always on the look-out for business leads and social media influencers to help develop their business models and in turn, boost sales and growth. The search, however, always does not yield much success. This is where the role of software like Ninja Outreach comes into play. The outreach software guides users in the best way possible to find business leads, social media influencers and emails anytime, anywhere in the world. Ninja Outreach has a vast data pool of influencers, which the users can tap into to come across numerous profiles and their contact details. 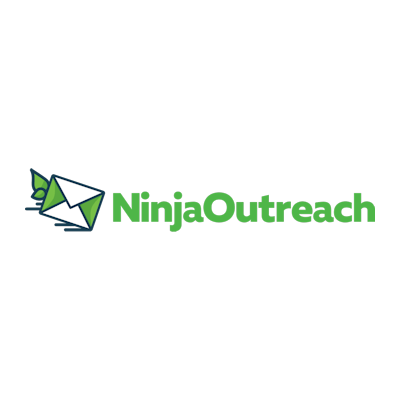 For guest posting openings and influencer connections, Ninja Outreach is the perfect tool. Bloggers have often talked about the difficulties in locating excellent guest bloggers and social media influencers. The vast database of Ninja Outreach turns out to be helpful at this juncture. The effective search engine of the Ninja Outreach software will immediately list out all the influencers according to the keywords you have posted. This is the most important advantage of the software as it narrows down a wide search to accurate results. The Ninja Outreach software thus helps bloggers and companies locate guest bloggers and social media influencers without much wastage of time and effort. In fact, time is the main reason why more and more companies use Ninja Outreach as it takes away the difficulties of the physical process of searching for bloggers and social media influencers. The Ninja Outreach software helps users search for their prospective influencers with the help of definite keywords. Helps clients find business leads easily with the ever-ready influencer database and e-mail outreach software. By using Ninja Outreach software, one can manage hundreds of contacts and export lists as per their choice. 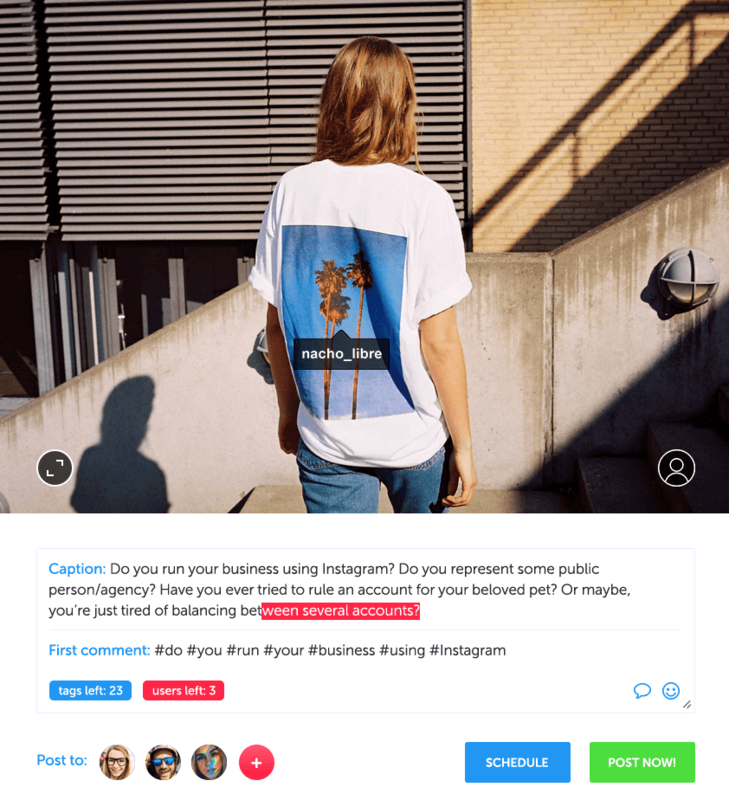 Ninja Outreach tool helps companies find top-rated Instagram and Twitter Influencers. As these accounts will have many followers, any association or promotional activities with them is bound to be positive for the user. Ninja Outreach has an adept influencer marketing agency software, which helps companies grow their business by leaps and bounds. By using this software, it becomes very easy for users to manage the different types of bloggers and social media influencers they are working on or interacting with. The Ninja Outreach software has another interesting feature, which helps users create email templates and send them out directly from the software. This can be usually done from within the interface and is, therefore, a big positive. The online tool also has an all-in-one link building software that proves useful in supporting the link building strategies at different steps of the interactions. With features as diverse as those, it’s no wonder that the Ninja Outreach tool is gaining momentum with each passing day. After you reach the Ninja Outreach home page, then type in with specific keywords what you are exactly looking for. The software will then list out all the information you are looking for. The information will have their profiles, contact information, SEO profiles, traffic, and engagement data. This helps users decide on which social media influencer/blogger to proceed with. The user can save the required information onto a list, which can then be shared with team members for further use. You can also connect with each listed profile on an individual basis. After you have finished selecting, simply load your list and the e-mails will be sent automatically with your customized templates. Last but not least, Ninja Outreach also tracks email opens, clicks, and replies for the user to be up-to-date. Like everything else, this software too has its pros and cons, some of which are listed below. Large database: The biggest advantage of the Ninja Outreach software is that it has a very large and wide database of bloggers and influencers, which clients can put to great use. You can always find someone useful for your business in this index. Saves time: With the help of Ninja Outreach, one can save a lot of time and therefore effort in finding social media influencers for business purposes. Useful training: The training offered by Ninja Outreach staff is accurate and highly useful. The training videos help the users navigate the tool quite easily. No Proper User Feedback: A negative fact about the software is that it does not offer proper user feedback. Security risks: The Ninja Outreach software works by integrating the user’s email address, and this can cause security risks. Most users would be wary of giving out their email-ids in the public domain. The Ninja Outreach software is an excellent choice for people to get in touch with guest bloggers and social media influencers to showcase their products and in turn experience business growth. Although there are some security issues, overall, the start-up is a good online tool for effective marketing. Posted March 19th, 2019 in Social Media. Tagged: bloggers, influencers, link building, outreach. Creating, planning and promoting content via social networks are not as easy as they seem, especially if you manage a few profiles and have to do everything by yourself. This is when social media marketers often start depending on external tools. Although there are many solutions to choose from, the majority has pretty much the same features. When searching for the right tool for your needs, it’s worth to select the one that stands out and offers something more. Just like Kontentino does. The more content you create, the more difficult it gets to have it all organized – especially on various profiles. 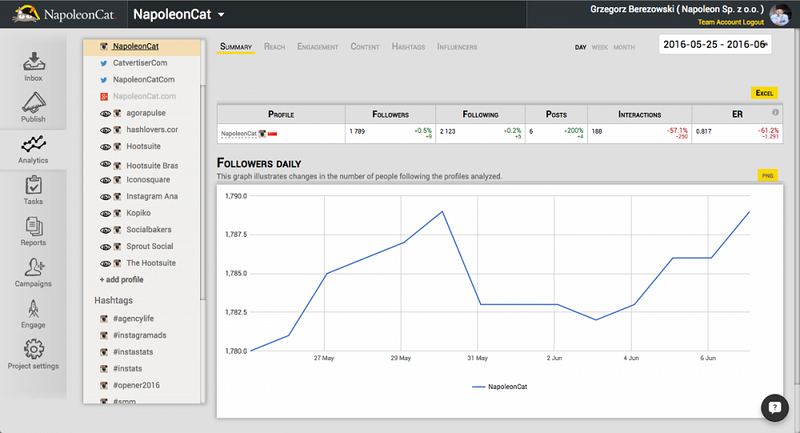 Kontentino aims to change that, making social media management easier. Thanks to an intuitive calendar, you can keep all important details, posts and inspirations in one place. You can also use this tool to send posts for approval to your clients, and once you get their feedback – set up a schedule, or even boost them in advance. These are not the only features, though. Kontentino was initially created as an internal tool in an advertising agency, just to serve marketers better. It has been growing ever since, simplifying social media management for many other companies around the world. It’s not just a simple calendar to schedule your posts on Facebook, Twitter, LinkedIn or Instagram. 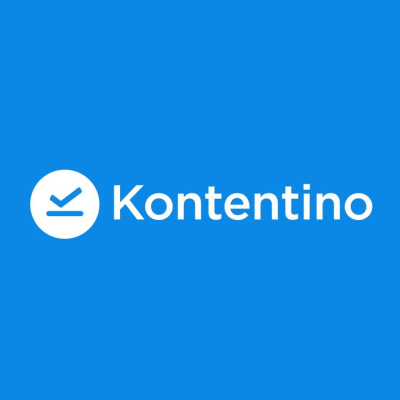 Kontentino lets you manage your content, as well as your tasks. Useful insights and reporting to let you check how well your content is performing. Once you set up an account and log in, you can see a dashboard with three different columns: ongoing projects, posts scheduled for the specific day, and tasks assigned to all team members. In the “Calendar” section you can create and edit posts, send them for approval to your clients, schedule them whenever you want to, and have an overview of all your planned content for a given social media channel. “Inspirations” allows you to store post ideas in one place, so that your team can easily get inspired and share their thoughts within the calendar. “Albums” is where you keep all visuals to use them later in your posts. 5. The last section, “Insights & Reporting”, is full of important indicators of how well your posts are performing. The ability to set boosting for all scheduled post in advance. It’s not always intuitive – but is still improving. Kontentino is a convenient social media management tool, which any marketer can take advantage of. Although it has a few flaws, it offers many useful features that you won’t find anywhere else. It’s definitely worth turning a blind eye to some shortcomings, as long as you want to increase your efficiency when managing multiple social media profiles. Posted December 11th, 2018 in Social Media. Tagged: calendar, facebook, Instagram, LinkedIn, profiles, twitter. You know how totally inappropriate it is when a huge celebrity actor totally unrelated to food features in commercials or becomes the brand ambassador for a grocery store chain? What sense does it make when someone like Mike Tyson promotes a brand like Nickelodeon? What we’re trying to get at is, that often the most beaming of businesses make the somewhat misplaced marketing decision of hiring celebrities for promoting their brand just so that they can have a known face at their front, thinking it will create a great brand image for them. While it may work in some cases, in others, it can fall flat leaving such businesses out of millions of dollars and probably, loss of some customer base. Now picture this. Instead of spending so much for the popular face who probably doesn’t even relate to your line of business, wouldn’t it be much more apt and smarter if you could rope in some non-celebrity who has a lot of followers on social media (Facebook, Twitter, Instagram, etc.) to promote your product / service among their following for a much lower price? Such people are known as influencers since they are in a unique position to sway the liking of a lot of people (their social followers) in favor of a product or service. Influencer marketing is the buzz-term in business circles these days and if you know what we’re talking about, you’d love to check out the online tool we’re covering today – Intellifluence. 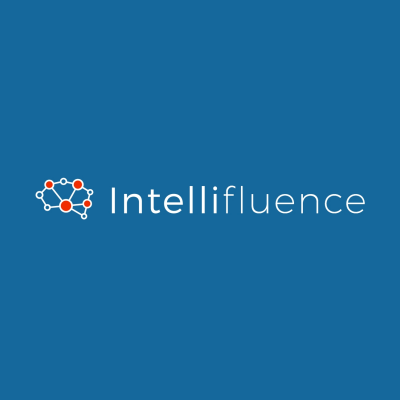 Intellifluence is a SaaS platform that connects you with influencers who have a large social media following and whose followers in turn have a large following. 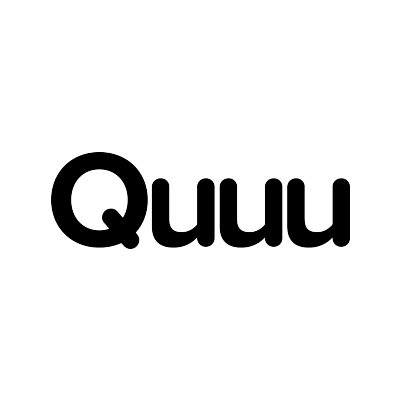 By letting you reach out to an influencer, encouraging you to let the influencer try out your product / service, and share their positive experiences on social media, you get the benefit of a word-of-mouth kind of marketing to an extremely large group of people through the medium that has proven to be the most effective way of creating buzz about a product / service. And all that at a fraction of the cost you would have to invest if you tried to sign up a celebrity to do the same. Cool or what?! Come to think of it, using everyday people to promote a product / service in this way does sound like a pretty smart idea. Good points to the people behind Intellifluence. This section is dedicated to the other side of the Intellifluence coin – the influencers. If you are somebody who produces quality blog or social media content and have a faithful following, you can join Intellifluence for free and allow them to recommend you to businesses that are looking for influencers to partner with. Not only do you not have to spend a penny, you get to receive free products and benefit from attractive giveaways simply for doing what you do. Wow! Check out how easy it is to use Intellifluence. Note: To join as an influencer, you must be at least 13 years of age and if below 18, you must have the permission of a guardian to join. Now you’ll be asked to enter some personal information about yourself in order to show why you are a great influencer and how you can help brands by promoting their products. Note: Here, when prompted to enter a bio, make it as appealing as possible by highlighting all that you think will make a brand want to pick you as their influencer. You can’t lie of course! Select up to 5 areas for which you wish to receive pitches from brands and also specify how you wish to be compensated and the minimum you’re willing to accept for your work. This will make you visible only to those brands who are willing to offer products or cash that match your minimum compensation criteria. Note: A tip here, the lower you set your cash and product compensation limit, the more pitches you’re likely to get. For more details on what to do when you receive a pitch or how to approach a brand, you can watch one of the many YouTube videos Intellifluence has on offer for Influencers. To join Intellifluence as a brand, you’ll need to sign up for a basic plan. Unfortunately, there’s no free trial plan for brands so you’ll need to provide your credit card details right at signing up time. Intellifluence makes for a great connecting platform for brands and influencers, and that too for a price as low as $9 a month even for top brands. Plus, it lets influencers benefit from cash and kind too, so it’s really a win-win tool. The only feature which would probably be great to have would be a trial package for brands wherein they are allowed to at least search for influencers and send out a limited number of pitches. This can help give them an idea of how effective the platform can be. Regardless, we loved it and would recommend it to every social media influencer out there. Posted July 6th, 2018 in Social Media. Tagged: followers, influencers. What is the easiest way to get people talking about your product, service, or business? Advertise it on social media; and since the past few years, social media has become synonymous with Facebook. The platform which started off as a means for people to connect with their far away friends and relatives has now transformed into one of the largest places to advertise stuff and capture potential customers easily, and super quickly. As time and market strategies evolve, businesses change their advertisements after every few months to keep users engaged. Plus, at any one point, there are a huge number of different ads running on Facebook for the same product / service / company. From a manufacturer, business owner, or vendor’s point of view, keeping track of the hundreds of ads running for their business on Facebook can get tiring and inconvenient. Monitoring which ad is running on which page, in which language, and how frequently, takes up a significant amount of time and patience. And when you’re running a business whether medium or small, you frankly don’t have the time to track all your ads. That’s why today, most smart advertisers make use of automated tools to keep tabs on their ads running on Facebook, Twitter, Google+ and other social platforms. In this post, we’re covering the best and worst aspects of one such extremely useful tool for managing Facebook advertisements – FastTony. Let us find out all there is to know about it. 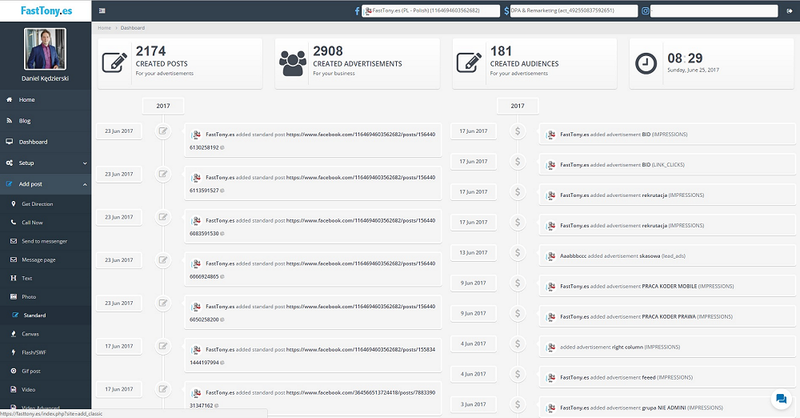 Among the plethora of advertisement trackers available online, FastTony is one of the most progressively developing Facebook ad management tool with built-in plug-ins to Facebook, Instagram, many supporting Apps and even whole environments such as WordPress. It wouldn’t be entirely wrong to call FastTony an ecosystem which brings automation to Facebook campaigns while making non-standard format ads more effective and engaging. FastTony being so intricately linked with Facebook has its advantages. For one, you’re always ahead of your competition. If a new solution is introduced in Facebook, you have access to it immediately. Other distinct benefits include the variety of original solutions the tool has like split-tests and weather control ads which are so unique you’ll find yourself awed. Supports various post formats like standard, video, Carousel, Lead Ads, etc. Allows creation of posts on your Facebook page with features like editing photos, adding call-to-action buttons, etc. 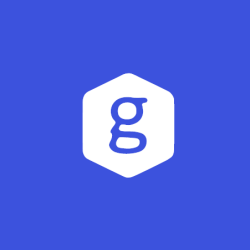 Additionally, the tool is available as a mobile-app that gives you access to real-time stats and lead ads support while letting you edit campaign bids, archive campaigns, and do a lot more. 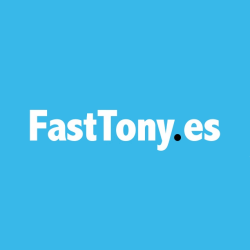 To start using the tool visit its homepage at fasttony.es and click on the button that says “Create Free Trial Account”. Quite amazingly, you’ll straightaway be directed to a dashboard-like page, but very expectedly, you won’t be able to access any option without logging in. On closer look at the options displayed in a bold sidebar on the left, you’ll find the ‘Dashboard’ link which will make this clear. To log-in, you’ll need to supply the Facebook credentials you use for your business. Once you’ve give the tool all access permissions, you will see your revamped dashboard with your Facebook profile picture sitting pretty at the top of the left sidebar. 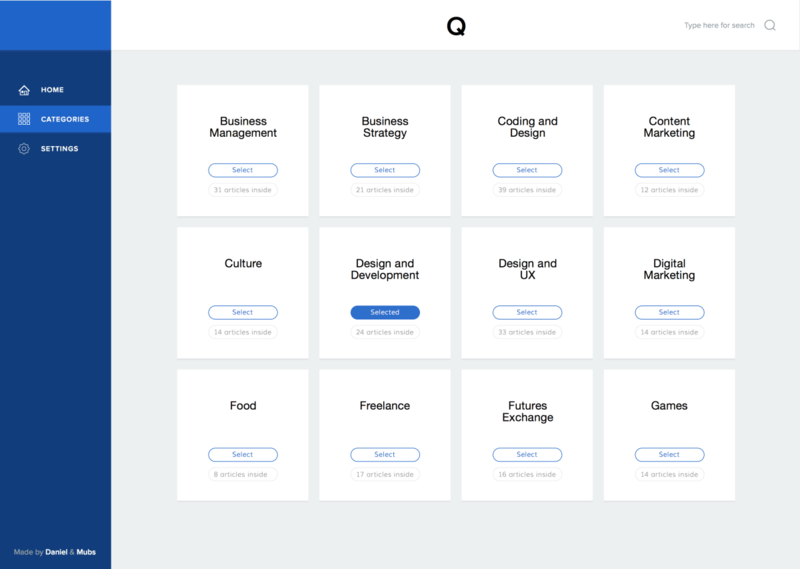 You’ll see a ton of other choices available in the sidebar which will give you access to a huge number of functions of the tool. In this regard, FastTony is truly a great way to customize and manage your Facebook advertisement campaigns if you know how to use it well. While the pros of the tool are obvious, the cons are a bit subtle. You won’t really find any flaw with the tool except a single one – it is quite confusing to work with. For a small business or professional working with Facebook ads for the first time, using this tool would be like trying to find the way through an extremely complicated maze. Yes there are a lot of customization options in the tool, but the huge number of options makes it very confusing. Add to that the absence of a help link, application tour, or “getting started” video and you might be lost even before starting to work with FastTony. Good tool with a number of ad management options but only for experienced users. Newbie users would have a hard time figuring their way around the tool. Posted January 15th, 2018 in Social Media. Tagged: ads, automation, facebook, management. Since the advent of social media, everybody has been in the race for monitoring and sharing engaging content. From free downloads to reward programs, every action has been focused on the sole idea of sharing content. Where some companies allow healthy sharing of links and encourage link building, one company playing this game the dangerous way is Snip.ly. Snip.ly is a marketing tool that helps you drive conversions through every link you share on social media. Whenever you come across something worth sharing on the Internet, attach a custom call-to-action to your share link and convert what could be a simple share to something that drives conversion for you. Let us show you how. The tool is available as web application as well as a widget. It allows you to attach an eye-catching button, custom banner image, hyperlinked text, or email capture form to the post you share. Users can click the button to visit your webpage directly or in the case of email capture, sign up for your mailing list. 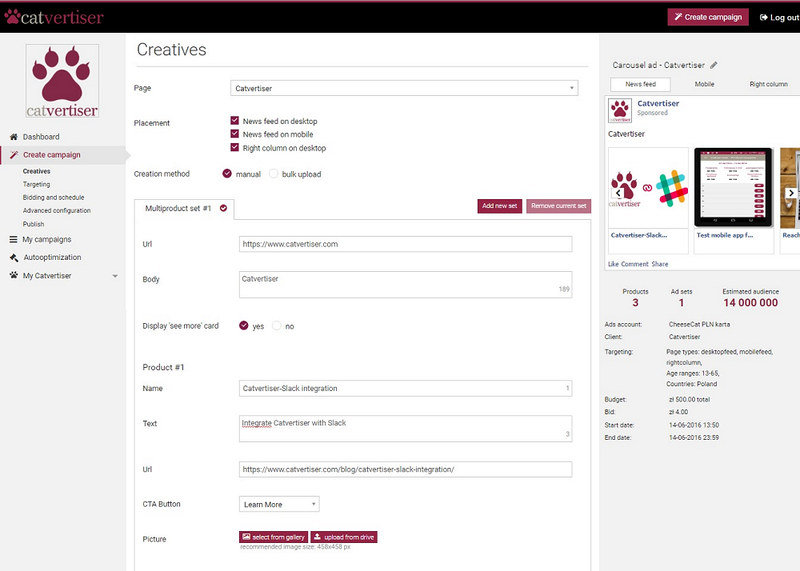 The tool gives you access to a wide range of themes, custom colors, positioning, custom domain, short-links, and more. 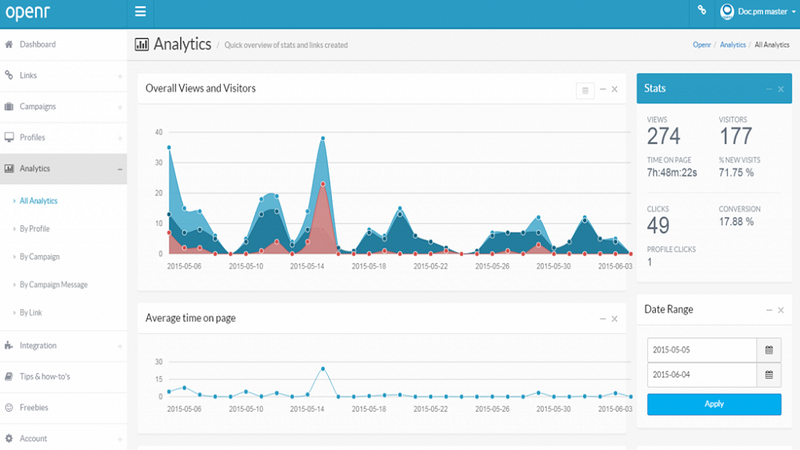 Using Snip.ly you can track and analyze your clicks and conversions through snips. Snip.ly integrates with a ton of apps, extensions, and APIs. With the tool, you can also include custom code for tracking, CSS, scripting, and even retargeting pixels to your snips. Find content on the internet that is relevant to your business. Ensure that you select content that already has a lot of footfall and is directly connected to your domain. Go to the Snip.ly web app at snip.ly. After you sign up, click Create My First Snip on the left panel. Generate your brand profile and click Continue. 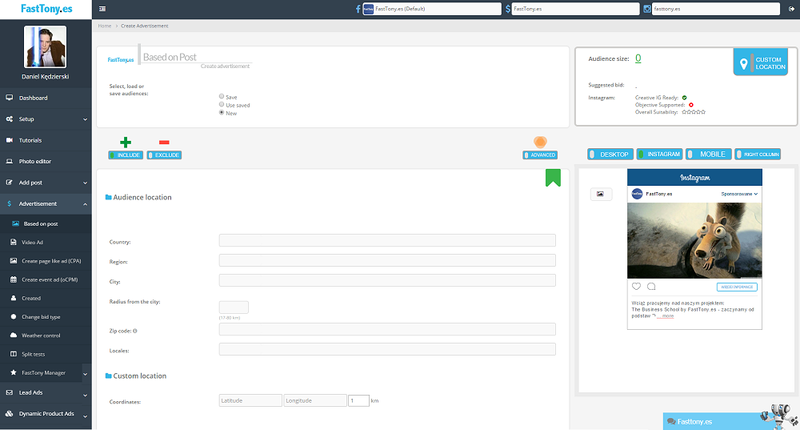 On the Setup your CTA pane, type your call to action message in the Message field. In the Button Text field, type the text you want to display on your call to action button. In the Button URL field, type the URL of the website you want the reader to be directed. On the Choose a page to snip panel, type the URL of the content you identified in Step 1. Snip.ly will generate a compressed URL for you to share. Copy the compressed URL and start sharing. You can share this URL on LinkedIn, Facebook, Twitter, whichever social media site you may wish to share it to. It is, as of today, the easiest way to share content. It is simple to use and it comes with a free version. It gives you a better chance to obtain new traffic to your website and also convert it. The Analytics page gives you a detailed report on your snips, including the total number of clicks and conversions. The use of Snip.ly is somewhat considered controversial. Unless you give credit to the original content creator, using content freely for your own gains can be frowned upon. Readers are usually not very happy to see ads on their favorite sites. You might tick off quite a few of these people. While there are no legal issues surrounding the subject, ethical infringement can be a matter of concern for some of us. 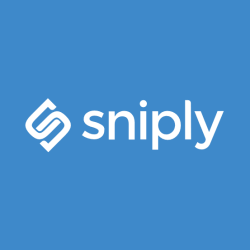 The basic account registered with Snip.ly is free and allows users to create one user profile with the ability to share unlimited number of links, and extract up to 100 conversions a month. The tool also offers different paid packages with different range of benefits. They typically come at a price of $16 to $85 a month, ranging from 500 to 5000 conversions along with the ability to view your analytics. The paid versions allow a lot of customization in the form of themes, colors, positioning, and so on. They also come with data gathering tools such as analytics and conversion pixel. While it is easy to use and everything, one thing that bothered us while using it was the matter of ethics. However, this can be overcome if you decide to mention the credit to the original content creator. Snip.ly might have been acquitted of all legal infringements, but it is still high in controversy. If you feel comfortable with that, there is no reason why you shouldn’t start snipping and attracting traffic. Posted October 5th, 2017 in Social Media. Tagged: content, conversion, CTA, sharing. Openr has been shut down in 2018. The modern online space is ruled by articles. People are information hungry. They wish to read about and practice good habits, food choices, lifestyle decisions, work ethics, and everything else as other people like them. That’s why they keep researching online, monitoring product reviews and success stories, and engage in online communities. So if you have a product or service that you wish the world to know about, the most efficient way to do it would probably be to popularize it online by generating targeted content. Sounds simple enough! But in reality, writing about products and services and actually being able to convince people to invest in them are two different things. You can boast and brag about your delicious yogurt based products, their health benefits, and how millions have used it to their advantage, but being able to drive an online visitor into clicking that “Buy Now” button isn’t exactly a cakewalk. Need a little help there? 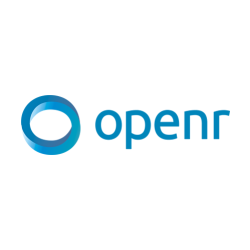 Try Openr! Openr is an innovative online tool that lets you convert content into action. It lets you drive your marketing content such that you can turn awareness into actual business. Normally, to convince people into buying your product you’d need to generate marketing content of the highest quality produced by some of the finest writers and marketers. With Openr, you won’t that anymore. The platform can be thought of as a personalized conversation starter that allows you to engage your audience with your earned content such that they cannot resist making a purchase. There are a lot of other cool features packed within this tool. Visit it to find out more. When we were reviewing the tool, new user registrations were closed since the tool was being acquired by some other bigger player. So we read a couple of success stories in the tool’s blog to find out exactly how they used it. What we gathered from the stories is summarized here. Suppose you have an edible product that helps boost immunity. Instead of creating direct in-your-face content to push it across to your users, create content that’s more subtle, like tips to lead a healthy lifestyle by eating healthy food and consuming natural products. Thereafter, use Openr in conjunction with whatever tool you’re using to promote your content. Openr will make it so that with every click on the content readers will see not only your content, but also your product’s Openr message. The message will link the content to your brand thereby driving awareness. The subsequent call-to-action in the message would be to add your product to basket in a chosen supermarket, to drive sales. Pretty neat if you ask us! To be fair we wouldn’t want to comment on this product since we didn’t get a chance to use it fully. But if it indeed does what it says, it would be a boon for organizations looking for a more concrete online marketing strategy. That is, of course, if the tool doesn’t have a steep learning curve attached with it. Like us, you’ll have to wait for new user registrations to begin to find out how worthy this tool actually is. Posted July 3rd, 2017 in Social Media. Tagged: CTA, earned content, link tracking, sharing. Every individual and organization today uses social media to stay updated about the latest trends, and to announce their doings (put simply) to the world. Facebook, Twitter, Google+, Instagram, YouTube, and the like have surpassed the stage of being mere platforms where people share their thoughts. They’ve become endless canvasses that can be used to express, debate, support, retaliate, advertize, campaign, and do much more. The power of social media is growing each second, and to truly become successful, one must learn the skill of using social media to his advantage. And NapoleonCat lets you do not just that, but also master the skill of perfect social media marketing through a few clicks. 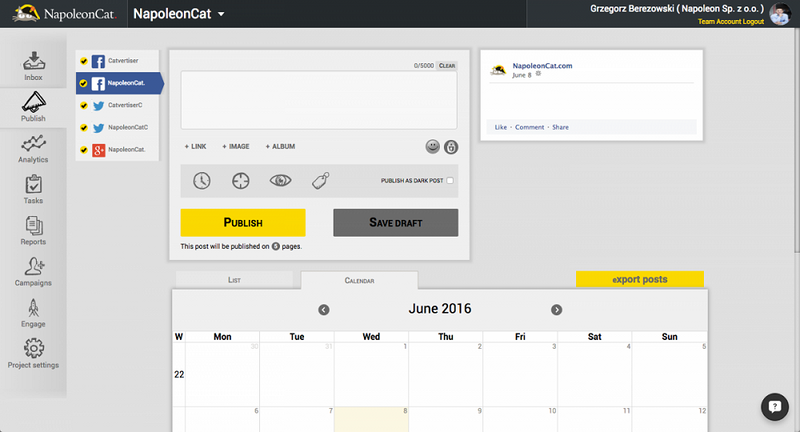 NapoleonCat is a web portal that lets you publish, monitor, as well as analyze your social media marketing across various platforms such as Facebook, Twitter, Google+, etc. The tool allows you to manage your entire online marketing program on all major social platforms from a single interface. Additionally, it includes a bunch of customization options that let you master the art of using social media as per your convenience. There would hardly be a business / professional today who aren’t marketing themselves / himself online. But most of the lot stick to the traditional approach – have a website, a blog, a profile on various social media platforms, a tool to analyze the traffic your posts attract, a tool to engage in interaction with clients or readers, and maybe a tool to monitor competitor moves. Having to keep track of so many different tools can be rather inconvenient and hectic. Instead, why not switch to one application that combines the capabilities of all such tools and also offers much more? That’s what NapoleonCat achieves. With a feature set as powerful as this one, NapoleonCat is one tool probably every business should have by their side. To start experiencing the magic of NapoleonCat, click on the ‘Start Your Free Trial’ button on the homepage. A quick sign-up later you’ll be prompted to start setting up your first project. Key in the details as required and proceed. You can also view social page / profile statistics for any person, brand, etc by clicking on the ‘Stats’ button from the Main menu. It opens up a drop-down that shows the names of popular social platforms. Select the one you prefer and you’ll be redirected to a page with a large search box and a table of the top 100 profile names, the number of their followers, and percentage follower change. Ignore the table for now and type in the name of the page or profile you wish to see the stats for. For example, type ‘Barack Obama’ in the search box and click on Search. The official ‘Barack Obama’ page for the platform you selected will be listed as the search result with all the related information. To view detailed information about the page, click on the ‘more >’ button on the right hand side. 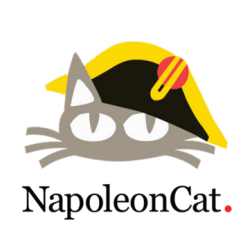 If you cannot see the page or profile you’re looking for, NapoleonCat provides you the option to add it to their database. 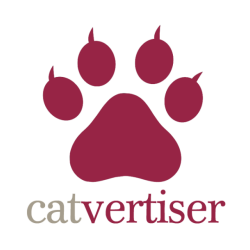 Just click on the long green button that says ‘… Add to our database.’ You should see a pop-up prompting you to enter the URL of the page or profile you wish to add to NapoleonCat. Provide the full URL (including http://) and click on ‘Search’. Once you spot the one you’re looking for in the results, punch in the country, type, and category of the page / profile and click on ‘Add’. That should do it. There is a small menu at the top right corner of the screen that includes the options to view your Team details, your Account settings, and Logout. Yes, that’s a menu; we were confused at first too. The pros of the tool are quite obvious. Need we say any more? As far as the cons are concerned, $67 per month for 1 user, $127 per month for team of 3 members, and $259 per month for 10 members, sounds a little too pricey. But then, it’s a matter of convenience and time-saving versus money. Quite a useful online tool, but suited for organizations, not individuals. Highly recommeded. Posted November 24th, 2016 in Social Media. Tagged: analytics, facebook, google, Instagram, profiles, publishing, social media marketing, twitter, youtube.